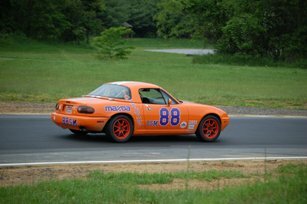 Ted Cahall attended the SCCA Club Racing National event held at his home track at Summit Point Raceway on May 21st and 22nd. While the world did not end as some had predicted, the weekend was not as smooth as many of the SM drivers would have liked. Ted qualified 4th out of 21 cars for the SM race on Saturday after great practice sessions on Friday and Saturday morning including a 1:28.1 and a 1:28.5 lap time. Unfortunately Ted's transmission blew out on the 13th lap of the STU race (which counted as a 4th place finish out of 4 STU cars entered). In the afternoon, after Glenn raced to replace the transmission, it rained during lunch and the beginning of the SM race. Ted fell from 4th place to 10th place. National Points are only awarded to the top 9 drivers, and thus Ted earned ZERO points for his best SM start/grid position ever. 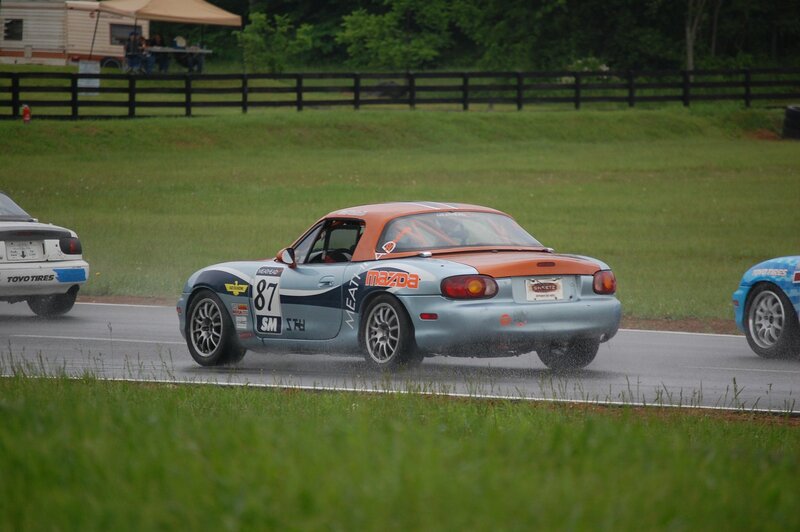 Rain practice is becoming necessary as both Summit Point events this year have been marred by rain. Ted's brother Bob Cahall (88 above) also attended and gained his National Competition License after competing in the regional SSM event. See Facebook photos of Summit Point National courtesy of Mike Kelley. As always, a huge thank you goes out to Glenn, Sherise, Wendy, Karen, Mike Collins and Meathead Racing for their pit crew services!